Aluma Line closed panel aluminum window awnings are designed for privacy and do not allow you to see through the awning panels yet at the same time protect your home from the elements. If you prefer to see through the window awnings then the better choice would be the Aluma Vue window awnings. These closed panel aluminum awnings can be tailored to fit windows sized from as little as thirty inches wide all the way out to one-hundred and two inches wide. There are nine different awning projections going from twenty-one inches out to forty-two and one-half inches. The aluminum panels clip on helping to eliminate any noise from rattling parts plus can be adjusted for their slope when installed. Another great feature pertaining to most quality made aluminum awnings is the fact that they take very little care and last a very long time. A little soapy water is all that's required to keep them looking like new. 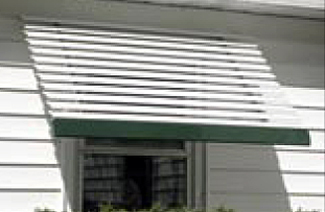 Over time they are one of the least expensive forms of awnings when you add in their consistent good looks and lack of deterioration as in most cases aluminum will outlast fabric awnings. The Aluma Line aluminum window awnings are designed to be "no rust" having their beautiful colors applied with baked on enamel. Whether you choose fabric or aluminum you will still receive all the great benefits which are derived from quality awnings particularly their cooling effect and sun protection in addition to an especially attractive home accent. Please note: Most manufacturers recommend an additional 3" to 6" of overhang on each side for the awning for cosmetic purposes.